Doubting Thomas; Are you half full or half empty? Thomas was a commercial fisherman who grew up around the Sea of Galilee and Jesus called him to be a disciple. For three years Thomas followed Jesus. I think Thomas may have been a late bloomer and a pessimist. I believe some of Jesus’ followers rejoiced and saw the glass half full, but Thomas saw it as half empty. He was full courage, yet possessed a streak of fatalism. Once, when Jesus and his disciples heard about their friend Lazarus’s death near Jerusalem, the center of Jesus’ opposition, Thomas commented darkly, “Yes, let’s go there that we might die with him.” His words are almost prophetic. Later in the story, Thomas’ world fell apart. He ran for his life in the Garden of Gethsemane when Jesus was arrested. On Good Friday he watched at a distance as they nailed Jesus to a cross on the Roman killing grounds of Golgotha. And as Jesus’ life drained away, so did Thomas’s hope and belief. Thomas’ belief was about a relationship. His relationship with Jesus. When Jesus died on the cross, so too did his relationship with Thomas. Thomas believed Jesus, he gave him his heart and his hope, and that belief couldn’t live beyond the grave. Unless, that is, Jesus lived beyond the grave, and that is so hard to fathom, that Thomas wanted proof before he handed his heart over to be burned again. I believe Thomas spent Saturday in shock and then on Sunday (Easter) he spent the day away from his friends. If I can imagine seeing Thomas, I think he was feeling disillusioned, dazed, hurt, bitter — and probably lashing out. Finally on Monday morning, the disciples went looking for Thomas so they could share with him what had happened in his absence. All the blood drains from Thomas’ face. Jesus turns to him and speaks plainly, without any hint of rancor or sarcasm, “Put your finger here, see my hands.” Jesus holds out his scarred hands for him to examine. Thomas recoils. Not out of fear, really, but from a mixture of amazement and revulsion. Thomas, “Doubting Thomas,” as he is sometimes called, is the first disciple to put into words the truth that Jesus is both Lord and God. “Doubting Thomas” utters the greatest confession of faith recorded anywhere in the Bible. What happens to him? 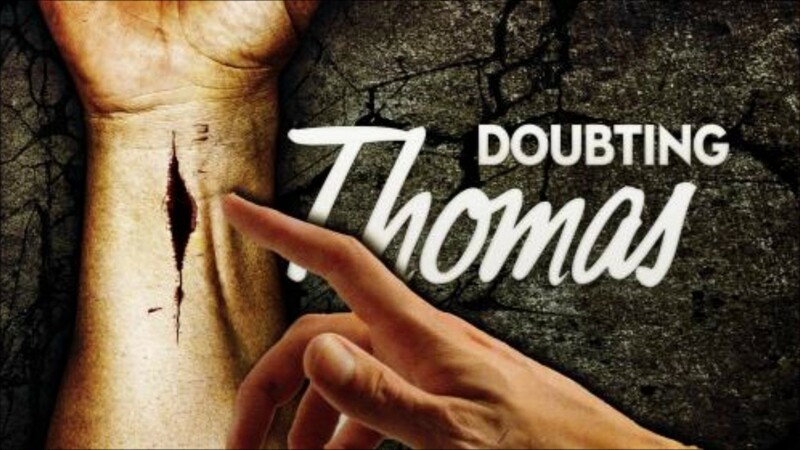 Doubting Thomas does not stay a doubter. When he sees the risen Jesus, all that Jesus has taught over the years now clicks in, and to his death Thomas is an outspoken advocate for his Lord. Church tradition tells us that he preaches in ancient Babylon, near the Tigris and Euphrates Rivers, where Iraq is today. He travels to Persia, present-day Iran, and continues to win disciples to the Christian faith. Finally, Thomas travels to the east coast of India, preaching relentlessly. He is killed near Mylapore about 72 AD, near present-day Madras. Tradition tells us that he is thrown into a pit, then pierced through with a spear thrown by a Brahmin. He who had so fervently proclaimed his unbelief carried the Christian message of love and forgiveness to the ends of the earth in his generation. Thomas clearly had fears and doubts. We all have doubts from time to time, that’s a normal part of living the life of faith, we shouldn’t begrudge Thomas for doubting. What Jesus longs for in this post-resurrection encounter with Thomas is that we all might believe in him by handing over our hearts and our hopes that he might bring them to the fullness of joy. That’s what living an Easter life is all about. That’s what Thomas wanted, he just needed to see it, touch it, experience it before he was willing to risk relationship again. If we can live this Easter message then we can truly live with the glass half full. This entry was posted in Faith, Faith and Spirituality, Motivation and tagged Christianity, cup half full or half empty, doubing thomas, easter. Bookmark the permalink.